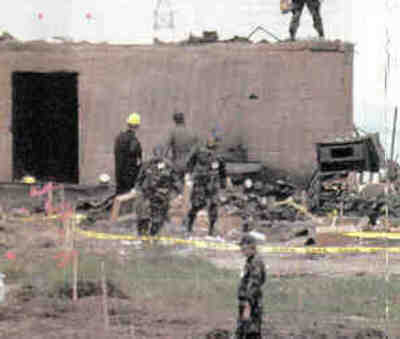 This photograph, published in US News & World Report, July 24, 1995, shows a red body flag at the extreme left margin of the picture in the grassy area (similar to the red body flag in Hole in Roof of Concrete Room). Under what circumstances did the person die? The official medical examiner's diagrams show no bodies recovered from this area. It is now time to turn our attention to the recovery of the bodies in the ruins of the Mt. Carmel Center. We have already seen in How the Pros Manage Mass Disaster Scenes that there are established procedures for the placement of flags at the locations in which bodies are found, for the orderly removal of bodies and body parts, and for the speedy placement of those bodies and body parts into refrigerated trucks. Dr. Peerwani should have been able to do a good job. He did not have to blaze new trails, and, as we have already seen in Smithsonian Comes to Waco, he was aided by world renowned experts from the Smithsonian Institution in the Nation's Capital. The fire had occurred on April 19 at noon. Yet Dr. Peerwani testified that he first visited the crime scene with forensic dentist Rodney Crow on April 21. "We examined the scene and in order to decide as to what sort of evacuation plan that we would institute, and following that, we returned back to Ft. Worth [sic]," he said (Transcript, pg. 5962). They decided that they would prepare a grid of the scene, "localize each and every body with a flag, we would then document the location of the body, diagrams and photographs, and following that, we would then carefully remove the body, place it on a white clean sheet and then secure that in a —in a trash bag. We had a truck there. We prepared for a refrigerated truck to store the bodies and then carry them to the Tarrant County Medical Examiner's Office. We also set into motion a process whereby we would examine the soil and the debris on and around the body, in order to collect body parts, tissues, the teeth and personal belongings that may have fallen off when the bodies were burned and destroyed," Dr. Peerwani said (Transcript, pg. 5962 and 5963). Each body was assigned a number, serially, as they were recovered. The numbered remains were labeled "MC Doe "Number"," MC being an abbreviation of "Mt. Carmel" (Transcript, pg. 5966). Yet this was simply standard procedure, a plan to be followed by any rescue worker, forensic anthropologist, or medical examiner at the scene of multiple deaths. How else could it be done? But "Dr. Peerwani's plan" was not followed in the critical 24-48 hours after the fire. The Texas Rangers were put in charge of the crime scene, and Dr. Peerwani's office was put in charge of removing the bodies--and there was little coordination between the two. The result was, once more, orchestrated confusion. Bodies were being recovered, but by whom? Who Removed Four Bodies Before Rangers Arrived? The ruins of Mt. Carmel were divided into sectors, and a Ranger put in charge of collecting evidence in each sector. Texas Ranger Israel Cano testified at the 1994 San Antonio trial of the Branch Davidians that when he first walked around his sector (presumably on April 20, when the Rangers were officially given control) he found four flags indicating four bodies had been found and removed (Transcript, pg. 771 and 798). Ranger Cano attributed their removal to the medical examiners. But Dr. Peerwani said he first visited the ruins on April 21. He acknowledged that only one body had been removed prior to his visit, the body of Raymond Friesen (Mt. Carmel Doe 1). Dr. Peerwani also said that the bodies were labeled serially as they were recovered. "And this is in fact the stage of the auditorium, and there were five bodies that were labeled 1,2,3,4,5, as you can see here. There were three bodies that were here in this area next to the kitchen and serving area, and these are the bodies 6, 7, 8." (Transcript, pg. 5968). If Dr. Peerwani's first visit was on April 21 and he numbered the bodies serially, what happened to the bodies removed before Ranger Cano got to his station at the crime scene on April 20? No numbers had been reserved for them, apparently. Were those bodies discarded, or moved to another location and then given an MC Doe number by Dr. Peerwani when he "recovered" them again? Mr. "Carl" Stern "Justice Department spokesman" said two bodies found Wednesday apparently were gunshot victims because they were found on the perimeter of the buildings and "were singed, not burned." "One of whom, frankly, his head was blown off," Mr. Stern said, "and the other one they didn't seem to know exactly where the wound was." DPS officials in Waco said they couldn't confirm or deny the Justice Department report. Mr. Stern said he didn't know whether the gunshot wounds were self-inflicted or whether the three "sic" had been shot by other cult members or were hit by ammunition that exploded in the fire. 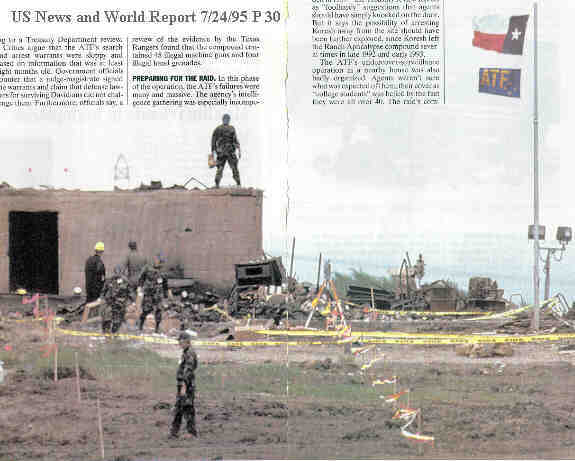 The photograph on the top of this page, taken from US News & World Report, July 24, 1995, shows a red body marker flag on the extreme left margin indicating the location of a body in the grassy area outside the ruined building. Note that the diagrams of the location of the bodies received from the office of the Justice of the Peace, Precinct 2, in McLennan County, show no bodies recovered in that location (Remains Recovered from Mt. Carmel, First Floor Surface, and Remains Recovered from Mt. Carmel, Exterior Grounds). Where did these bodies go, and if they do appear on the diagrams, what "recovery location" were they assigned? At least three Texas Department of Public Safety officers walked through the rubble on April 20 and saw a number of bodies, including those of children (The Washington Post of April 21). Several corpses were "discovered in a school bus that the Davidians had sunk beneath the compound as a bunker." (The Washington Post of April 21.) Notice that the official diagrams show NO body recoveries in the buried school bus (location of bus shown in US News & World Report, May 3, 1993, and official map of recovery locations in Remains Recovered from Mt. Carmel, Exterior Grounds). According to US News & World Report, May 3, 1993, one body was recovered near the swimming pool; that body is not reflected on any of the official maps, either. The bodies recovered from the school bus, the area near the swimming pool, and the "perimeter" were apparently placed elsewhere for later recovery by the Dr. Peerwani's team. Or perhaps they were just disappeared. "Loose lips sink ships." As can be seen in a the photo published in Time, May 3, 1993 a tank collapsed several stories of one wing of the building onto the trapdoor to the tunnel which lead to the buried school bus and tornado shelter (left side of photo; see Smart Diagram of Mt. Carmel, First Floor; the collapse of debris on the trapdoor was even acknowledged in Dr. Peerwani's testimony, Transcript, pg. 6043). The debris would have trapped people in those areas, had they been sheltered there. A tank, sporting the Stars and Stripes, was filmed spending several hours tracking back and forth over the tunnel area on April 19. (Some of this footage appears in Waco, the Big Lie, approximately 23 minutes from beginning of video). The back and forth motion of the tank, called "jitterbugging," was used in Vietnam to collapse tunnels and crush the occupants to death. Sensing devices can locate human bodies in tunnels. Certainly the tank would not have spent several hours jitterbugging over the tunnel with no purpose. Psychological warfare specialists, watching TV broadcasts of the Waco events, were no doubt aware that TV cameras had picked up the jitterbugging tank and broadcast it. It would not do to have bodies subsequently recovered from that area; the bodies would have to be surreptitiously removed and placed elsewhere. Now we look at the Department of Justice Report, page 299: "Another group of HRT agents risked their lives by entering the burning compound as the fire was in its final stages, to search for any children or other possible survivors. They entered the remains of the building, following a tunnel leading to the buried bus and then to a stairway and trap door. After finding no evidence of survivors the HRT agents left the structure." As we have just seen, the trapdoor was covered by debris. How could the HRT have "entered" the remains of the building to look for survivors? Tank operator R.J. Craig testified in the 1994 San Antonio trial of the Branch Davidians that he drove his tank to the trap door over the tunnel that led to the bus and gassed the area, for the sole purpose of preventing people from seeking shelter in the bus (Transcript, pg. 5513). Why would the HRT expect anyone to be in that underground area if the tank drivers had taken such trouble to make sure no one reached the area? As we saw above, the tank drivers collapsed one section of the building onto the trapdoor and jitterbugged the tank over the tunnel. The effects of those activities would be to trap and crush people who were in the bus or tunnel; is it likely they would suddenly be interested in rescuing those they had been trying to kill? Rather, if the HRT did go into the tunnels, it is more likely that they went to make sure no one was alive. When questioned on why she did not send helicopters over the inferno equipped with fire retardants, Janet Reno said she did not want to risk the lives of the helicopter pilots, whom the Davidians might attempt to shoot down. Yet she would risk the lives of her top HRT commandos, or Special Operations commandos, in a tunnel rescue attempt? Not likely. Cameras recorded US troops in dress uniform and in cammies walking around the burning ruins on April 19 (See Waco, the Big Lie Continues, one hour and 22 minutes from beginning: Soldiers in berets are from the 82nd Airborne Division). This "rescue" story, unlikely as it is, was better than no story to cover the purpose of troop activity. The more likely scenario is this: After it was realized the cameras had picked up the jitterbugging tank, Special Operations/HRT commandos were sent in to remove the bodies of persons crushed by the maneuver. The deliberate murder of mothers and children is still officially frowned upon in the US, and incompatible with the warm and fuzzy image desired by the US military. It is likely the corpses of the people so crushed to death were removed from the bus/tunnel area and placed in the concrete room to disguise the real time, cause, and manner of death, and that the purpose of the "rescue" attempt was to effect such removal. Perhaps their efforts were not entirely successful, and thus some additional bodies, those sighted and mentioned in the April 21 story--were still there on April 20. It is interesting to note that many of those found in the concrete room were said to have died of blunt force trauma and suffocation after burial--the same causes of death that would befall persons crushed by a tunnel cave-in. 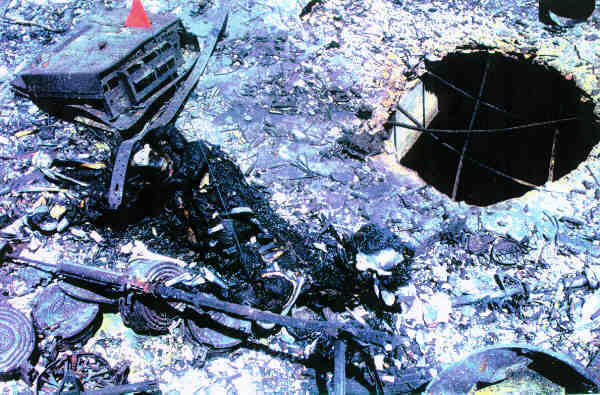 On April 20 FBI agent Jeffrey Jamar told The Washington Post (The Washington Post, April 21, 1993) that more bodies of victims would be found in a sealed concrete room inside the "fortress," and that the cult's ammunition was "cooking" in molten wreckage and creating a minefield for forensic experts, delaying the recovery effort. How did Jamar know where the bodies would be found? If the room was sealed, as Jamar said, and the fire lasted only 40 minutes, why would he not assume he might find survivors? And unless it was already known the people were dead, why didn't rescue workers go into the concrete room immediately after the flames died down to check for survivors? "Loose lips sink ships." The interesting thing about a contemporaneous report, such as this, is that The Washington Post story was written before the official date of recovery of the first body from the concrete room. Even if Jamar's quote were an invention of the reporter, we must then wonder how the reporter became clairvoyant. While organized anarchy reigned at the ruins, "federal explosives experts" were telling James Collier, Justice of the Peace in McLennan County, that a search for bodies would have to wait several more days—until Friday, April 23, maybe—for the ashes to cool off. See Chicago Tribune, April 21, 1993. The Mt. Carmel Center was under Judge Collier's local jurisdiction. Compare this information to Dr. Peerwani's trial testimony: "The first body that was in fact evacuated by the local justices of the peace and sent to us even before we went to Mount Carmel was MC Doe Number 1 …" (Transcript, pg. 5968). An article in The Washington Post of April 21, 1993 tells us that on April 20, "medical experts were already working to identify bodies, using dental charts and descriptions from families." This was the day before the official medical examiner team of Drs. Peerwani and Crow made their first visit and did nothing but lay plans, according to trial testimony (Transcript, pg. 5962). The cited source of the information was Dr. Rodney Crow, Dr. Peerwani's forensic dentist. In order for the schema to be included in an April 21 morning paper, it would have to in the hands of the paper by at least April 20. Once again we see that the people supposedly in charge—this time Dr. Peerwani--were not in charge, and that events were being guided by a hidden hand.